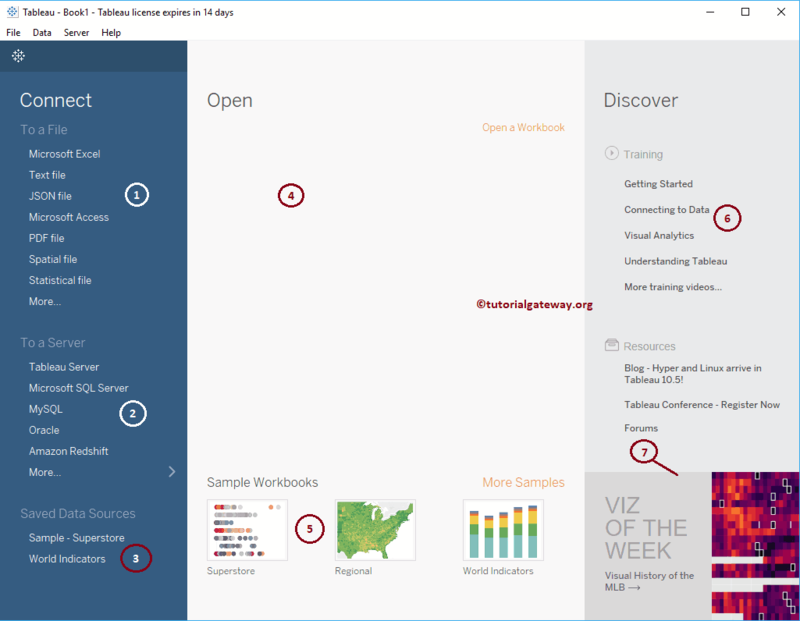 In this article, we will show you the Tableau Start Page. 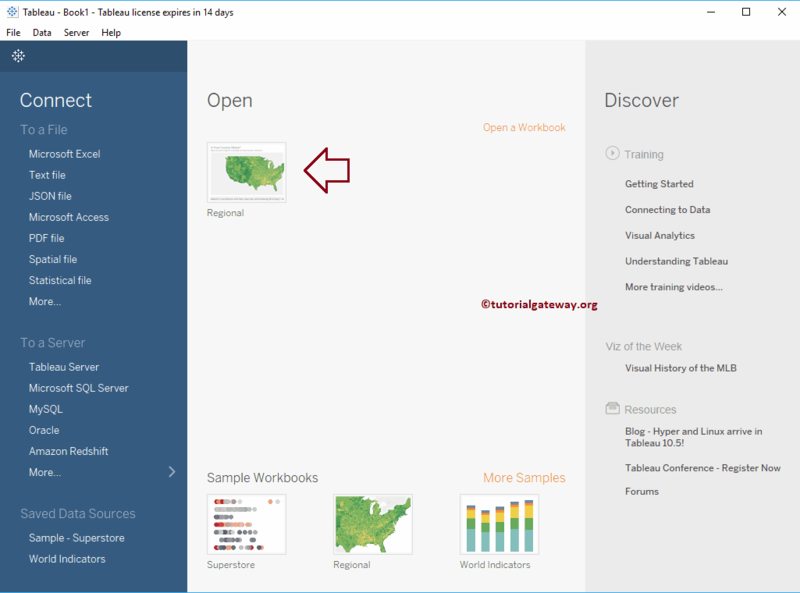 The Start Page in Tableau is the central location to Connect, or Extract Data for your report and Opens recently used Workbooks. 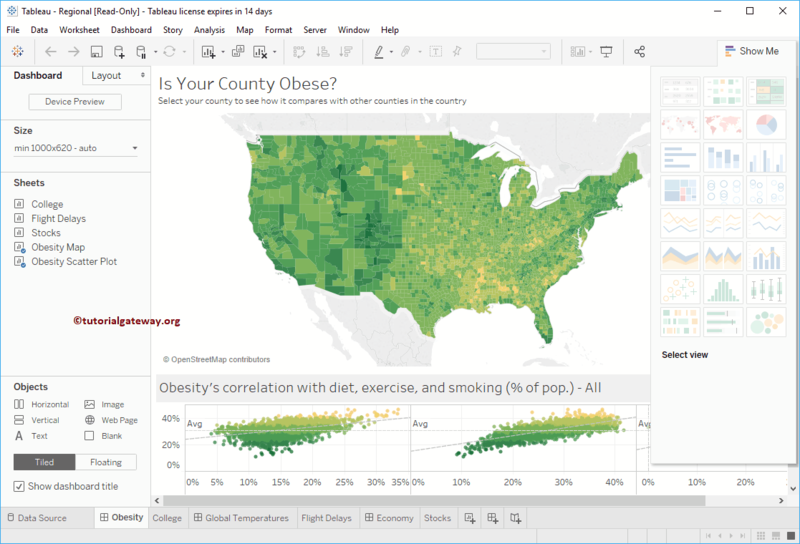 If you haven’t started the Tableau yet, Double click on the Tableau desktop to open. Once it is open, it looks like below screenshot. From the below screenshot you can see that we divided the Start Page into 7 Sections. Connect to a File: This section helps you to connect with Files, or allows you to extract data from files such as Excel, Text Files, PDFs, Spatial Files etc. 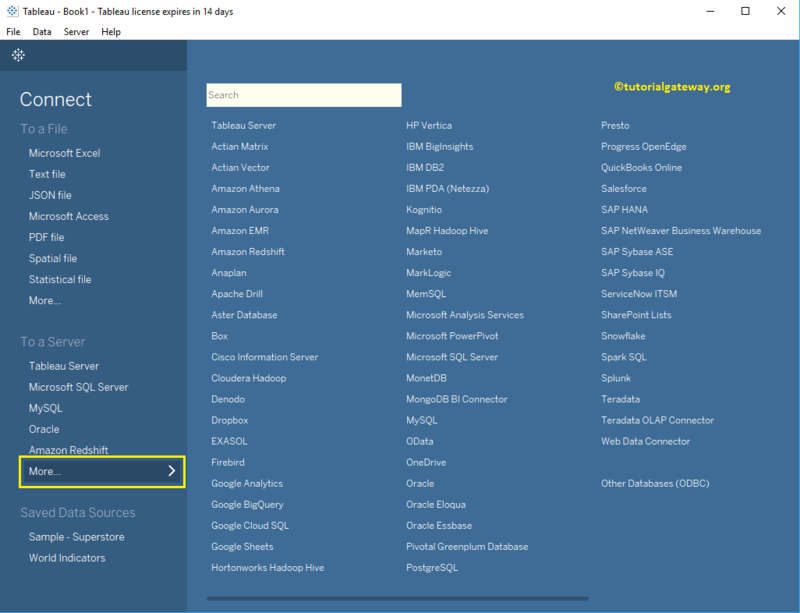 Connect To a Server: This section helps you to connect with the Servers, or allows you to extract data from servers such as MySQL, SQL Server, Tableau Server etc. Saved Data Sources: All the existing or Saved Data Sources will be displayed under this section. Open: Most recently used Workbooks will be displayed under this section. Currently, we don’t have any used workbooks. Sample Workbooks: These are sample workbooks that will come with Tableau Desktop installation. Training and Resources: Links to Useful Blogs and some videos. 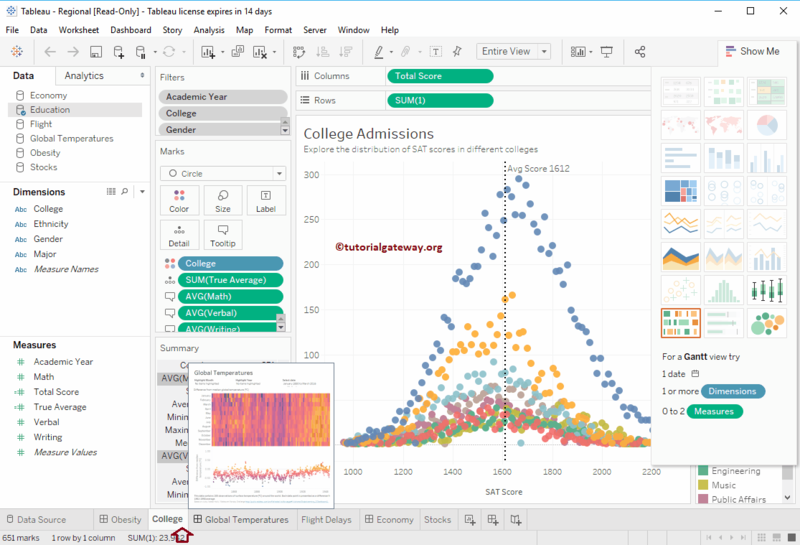 Content produced by the tableau Community. If your Server is not present under the Connect To a Server section then Click More.. hyperlink. This will show you the list of all supporting Servers. For this example, let me select the Sample-Superstore data source. 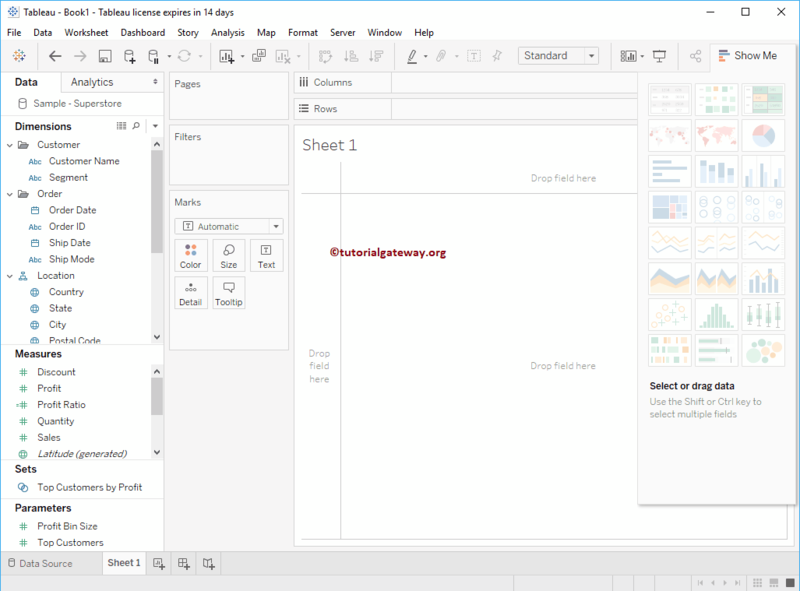 Selecting the Data Source will open a New Sheet to create a Report. Here, you can see the Measures, and Dimensions that are available in this data source. Let me open the Regional workbook to show you the Charts that are available. Selecting the Regional workbook will show you the Sheets that are available inside that workbook. 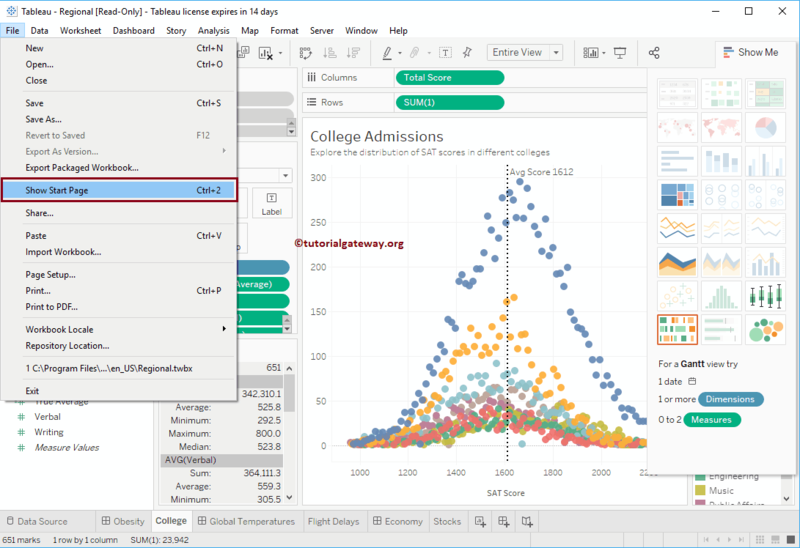 You can use them to understand the Charts that you can make from Tableau Desktop. If you want to go to the Start page at any point of time then Go to the File menu and select the Show Start page. Selecting the Show Start Page will open the Start Page and now you can see the regional workbook under the Open section. Because we recently used this workbook.